After winning the first football state championship in Clackamas High School history a year ago, what will the Cavaliers do for an encore? How about winning it again? A second consecutive 14-0 season is a longshot, but not out of the question. Clackamas is entrenched as one of the state's elite Class 6A programs, and although the Cavaliers have some work to do to replace the 21 seniors who were instrumental in last year's success, they have plenty of prospects who have been waiting on the sideline, waiting for this opportunity. "Our expectation is to be back in the mix for a league championship and a state championship," said Clackamas coach Joe Bushman, beginning his 20th season as a head coach and 13th with the Cavaliers. "We feel like we have that kind of ability. "Some things have got to really come together for that to happen. One of them for us is not being complacent. Our rallying cry over the off-season has been this term 'insatiable,' which basically means you're incapable of being satisfied. You're still hungry. So, that's one of the keys." Bushman also wants to develop a strong sense of team unity. "I know that was key to our success last year, and it will be this year, too," he said. "We can't duplicate last season. We've got different kids and different personalities, but the bottom line is we've got to learn to play for each other and check our egos at the door and do everything we can with 'team first' in mind." Most of the Clackamas players with varsity experience are on the defensive side of the ball, with two returning all-state, first-team selections -- defensive tackle Kelsen Hennessy and defensive end Justice Pagan -- anchoring the line along with nose guard Alex Hall. Linebacker Jake Bushman, an all-state, second-team pick, directs traffic in the middle of the defense along with Tyler Vaughn. If there are question marks on defense, they're in the secondary where the Cavaliers are filling the holes that exist around veteran cornerback Grant Schoen. "Grant's primary role is to be our leader in the secondary," Joe Bushman said. "We have some talented kids, but we're pretty green, so that's the area that we're really going to need to shore up during the next month." On offense, the Cavaliers return left tackle Brian Espinoza, as well as Hall, who is shifting from guard to center. After that, there are three spots still up for grabs. "We've found over the years that if you have at least a couple guys coming back to serve that leadership role, then the other guys will put in the time and the effort in the weight room, and things will fall into place for us," Bushman said. "We have about five other guys that we feel good about that are competing for those other spots right now." Noah Hobbs and Anthony Talavera top the depth chart at tailback, while Nehemiah Dedmon, Jack Dollens, Jalen Hammer, Richard Kennewell, and Thomas Tolonen are battling for playing time at the receiver positions. At quarterback, the Cavaliers currently have a two-man competition brewing between two juniors -- Austin Atkeson and Caleb 'C.J.' Jordan. "Austin has been in the program since he was part of the youth program and is playing at a really high level right now," Bushman said. "He's very efficient and has a solid understanding of what we're doing. And with C.J. around to compete with, Austin has really upped his game." 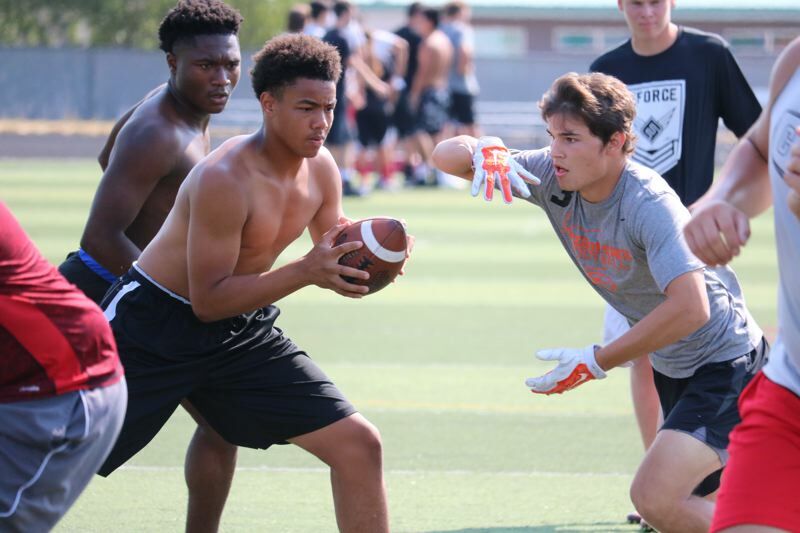 Jordan transferred into Clackamas after playing last fall at Jefferson High School in Portland, where he played for his father, Anthony Jordan, and was rated one of the state's top dual-threat quarterback prospects in the Class of 2020. "C.J. has a really strong arm and throws the deep ball as well as anybody I've seen," Bushman said. "He's athletic, he's a good run-pass guy, and he's really just now starting to grasp the system. It was a pretty tough learning curve that first month because everything was new to him, but he has done a good job of digging in and learning what we're doing. "He's getting better and better, so we have two guys that we feel good about." "We feel good about both of them, whoever is in there," Bushman said. "They'll compete throughout the next month and we'll see how things go. We haven't decided exactly what we're going to do yet." It's certainly doesn't hurt to have options. "We still have some key guys from last year's team and we've got a lot of young guys coming up that are hungry to get another state title," said Pagan, the senior defensive end. "I think that's what is going to drive us deep into the playoffs this season. "We're just going to have to work our butts off and prove to anybody who thinks we can't do it again that we're ready to defend our title." Pagan, who forced the fourth-quarter fumble that set the stage for Clackamas' 31-30 come-from-behind win over South Medford in last season's championship final, has been impressed with the level of commitment, effort, and enthusiasm that so many of his teammates have shown throughout the off-season. "I love what I see," he said. "I mean, the guys are out here working every day. The older guys, the younger guys, we're all putting in work, because we all want to get better and make one another better. "I think we like the high expectations, and if we keep grinding, we'll get back to that point we were at last season." Since the OSAA split to six classifications in 2006, only one team has won back-to-back 6A championships -- Central Catholic in 2013 and 2014. "One thing I caution myself about a little bit it I don't want these kids to feel a constant comparison to last year's team," Bushman said. "I don't want them to be thinking that it's, 'Win a state championship or bust.' It's not like that. "What I want them to focus on is being the best team that they can be, putting their best foot forward, and if you do that and things come together, you can be one of those teams there at the end. Even with that, there are no guarantees. You have to have some stuff go your way. "Anybody who wins a championship will tell you that at any level."